Jet Li is back on our screens ,after a couple of traditional films ,which we quite liked here and his small stint in the Expendables 2 Jet is back playing a tough cop partnered with his not so tough partner played by Wen Zhang. First thing that comes to mind when seeing this is the film Jet did with Jackie Cheung for W2ong Jing back in the day ,I'm sure everyone will remember High Risk,a film which Jet apologised to Jackie Chan ,for taking part in . Why because it lampooned Jackie Chan's ability ,the film was a result of Jackie and Wong Jing's falling out on City Hunter. So that might not bode well for this film. Thing was I didn't mind High Risk ,it was funny and had some good action. 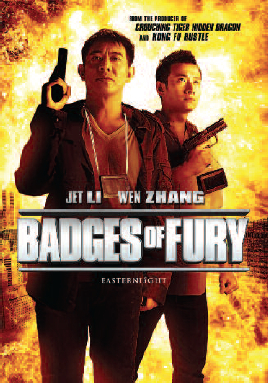 Now one thing about Badges of Fury is it has a stellar cast ,including Colin Chou,Wu Jing,Stephen Fung,Bryan Leung and even man of the moment Huang Xiaoming plus many others. With a series of murders taking Hong Kong by surprise and causing concern , Police detective Wang ( Wen Zhang) whose the station buffoon causes more concern when he announces they have a serial Killer on the loose. It will be up to him and his ageing hardened partner Huang Fei Hong ( Jet Li) , now being that his character name is that of one of China's greatest folk lore heroes and a character that Jet has portrayed more then once as we all know. Hong is tough but Li does not play the character like in his traditional roles ,maybe it would have worked better for him if he had. The film is Action choreographed by Corey Yuen Kwei who I feel has done to many films in America and has got stuck in the fast editing used to make non Martial artists look good . Here we have a cast of great screen fighters whose chances to shine are ruined by the same fast cuts and over use of wire work which really does not bode well in a modern day action film. In fact there is so much wire work that it actually becomes irritable , each approaching action scene is like a balloon being deflated ,you get ready to enjoy and then some crazy wire work ruins it all. The story is also just a series of slapstick scenes that mould the film together ,each of our cameo's from the many stars are just that and once again the action that would be possible is lost. It seems the film is trying to be like Stephen Chow's Kung Fu Hustle , but the director has no clue how to film it and the story is no match for Stephen Chow's mega film. What's more Jet Li seems to be in the film only when it's time for him to save his foolish partner Wang from making another balls up , Hong will appear on screen to save the day . I actually thought that when Jet Li faced of against Bryan Leung that all may be redeemed ,boy was I wrong. All in all Badges of Fury is pretty much a disaster , years ago Hong Kong movies could get away with all the slapstick ,mainly because it involved some quite dangerous stunts and the fight action more often then not would blow you away. I found it really hard to keep my concentration on this film with each scene I was let down time and time again. The film was Jet and Wen Zhang's third film together ,they starred together in Ocean Heaven and Sorcerer and the White Snake. I'm always excited when Jet goes back to China and Hong Kong and makes films because for most of the time ,they surpass anything he has made in the West , but this time he has starred in a bit of a turkey.